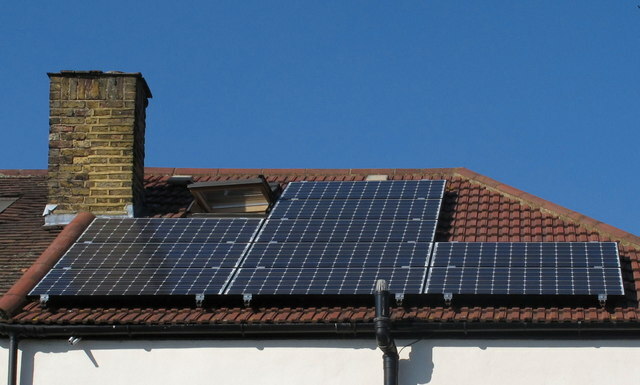 This series of photographs shows the installation of solar photovoltaic (PV) panels on a semi-detached house. The job was completed in one day by two electricians working inside, and two installers working on the tiled roof. The first stage on the roof is installation of support bars, so there is an air space between the solar panels and the tiles. The panels are installed and their DC output taken through into the loft, where an inverter produces AC. The cable from the inverter goes down through the house to the meter cupboard, where a generation meter and isolating switches are installed. The contractor was Treadlighter Ltd, chosen on a recommendation in Which? Local; they employed Ecovolt to install the panels. The system has a rated peak output of 2.4 kW; on the first day of operation, at the end of September, the peak output was 1.84 kW. A display unit connected by Bluetooth to the inverter shows the history of generation. One thing this showed was the major impact of any shadow; as the shadow of the chimney came onto the panels at 4 pm the power output dropped suddenly. This page has been viewed about 518 times. There are photos of each of the hundred centisquares (100metre x 100 metre squares) in this grid square. It is mainly residential, from TQ2081 : 1912 houses, Horn Lane, North Acton through many 1930s houses like TQ2081 : Friary Road, Acton, eastern end to tower blocks just completed in 2006 TQ2081 : Westgate flats, Victoria Road, North Acton. Facilities for local residents include TQ2081 : Horn Lane shops, by Brougham Road, Acton, TQ2081 : The Castle public house, North Acton, TQ2081 : Friary Park Community Centre, Acton, TQ2081 : Scout hut, Eastbourne Avenue, Acton, TQ2081 : Petrol station, Victoria Road, North Acton, TQ2081 : Car wash, Horn Lane, North Acton, TQ2081 : Doctors' surgery, Cloister Road, North Acton, TQ2081 : St Gabriel's Church, North Acton, TQ2081 : Cafe by Acton Mainline Station, TQ2081 : Electricity sub-station, North Acton, TQ2081 : Open space by Friars Gardens, Acton. Facilities used by people from a wider area include TQ2081 : Sunday cricket, North Acton Recreation Ground, TQ2081 : Self Store warehouse, North Acton, TQ2081 : Cloister Road Clinic, North Acton and TQ2081 : Memorials in Acton Cemetery. Facilities for visitors include TQ2081 : Ramada Encore Hotel, Gipsy Corner, North Acton. The grid square includes part of the large Park Royal Trading Estate. Buildings in this include TQ2081 : Phone supplier headquarters, North Acton and TQ2081 : Remploy factory, North Acton. Major transport links pass through the square, a trunk road TQ2081 : Western Avenue (A40), North Acton and three railways, here's one: TQ2081 : North London line railway from Western Avenue, Acton. We have an underground station and a main line railway station TQ2081 : Acton Main Line station. Local transport facilities include bus TQ2081 : Bus stop on Western Avenue, North Acton and bicycle TQ2081 : Emanuel Avenue with bicycle contra-flow track. as well as the many local roads shown in photos of residential areas. The railway also has sidings with depots and industrial sitesusing them, like TQ2081 : Concrete premix plant, Acton goods yard.